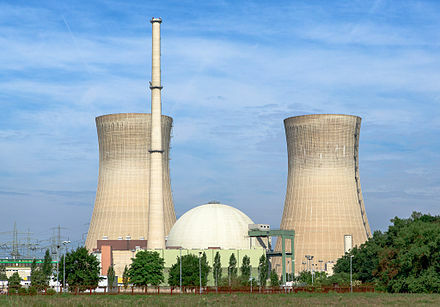 Nuclear plants are usually considered to be base load stations since fuel is a small part of the cost of production  and because they cannot be easily or quickly dispatched. Their operations and maintenance (O&M) and fuel costs are, along with hydropower stations, at the low end of the spectrum and make them suitable as base-load power suppliers. The cost of spent fuel management, however, is somewhat uncertain. The baseload on a grid is the minimum level of demand on an electrical grid over a span of time, for example, one week. This demand can be met by unvarying power plants, dispatchable generation, or by a collection of smaller intermittent energy sources, depending on which approach has the best mix of low cost, availability and high reliability in any particular market. The remainder of demand, varying throughout a day, is met by dispatchable generation, load following power plants, and peaking power plants, which can be turned up or down quickly, operating reserve, demand response and energy storage. Dispatchable generation refers to sources of electricity that can be used on demand and dispatched at the request of power grid operators, according to market needs. Dispatchable generators can be turned on or off, or can adjust their power output according to an order. This is in contrast with non-dispatchable renewable energy sources such as wind power and solar PV power which cannot be controlled by operators. The only types of renewable energy that are dispatchable without separate energy storage are biomass, geothermal and ocean thermal energy conversion. Electricity was generated by a nuclear reactor for the first time ever on September 3, 1948 at the X-10 Graphite Reactor in Oak Ridge, Tennessee in the United States, which was the first nuclear power station to power a light bulb. 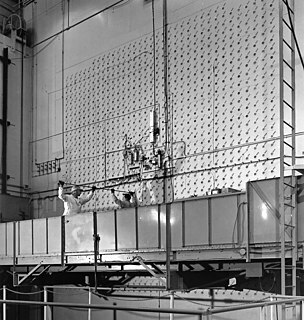 The second, larger experiment occurred on December 20, 1951 at the EBR-I experimental station near Arco, Idaho in the United States. Oak Ridge is a city in Anderson and Roane counties in the eastern part of the U.S. state of Tennessee, about 25 miles (40 km) west of Knoxville. Oak Ridge's population was 29,330 at the 2010 census. It is part of the Knoxville Metropolitan Area. Oak Ridge's nicknames include the Atomic City, the Secret City, the Ridge, and the City Behind the Fence. 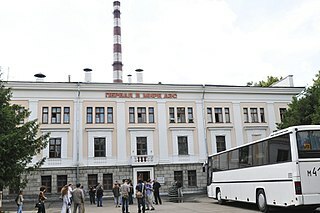 On June 27, 1954, the world's first nuclear power station to generate electricity for a power grid, the Obninsk Nuclear Power Plant, started operations in Obninsk, in the Soviet Union. The world's first full scale power station, Calder Hall in England, opened on October 17, 1956. The world's first full scale power station solely devoted to electricity production (Calder Hall was also meant to produce plutonium), the Shippingport Atomic Power Station in the United States, was connected to the grid on December 18, 1957. 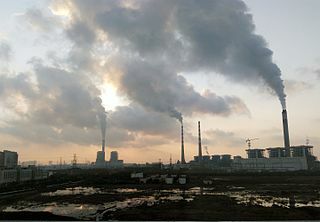 Obninsk Nuclear Power Plant was built in the "Science City" of Obninsk, Kaluga Oblast, about 110 km southwest of Moscow. It was the first grid-connected nuclear power plant in the world, i.e. the first nuclear reactor that produced electricity industrially, albeit at small scale. It was located at the Institute of Physics and Power Engineering. The plant is also known as APS-1 Obninsk. It remained in operation between 1954 and 2002, although its production of electricity for the grid ceased in 1959; thereafter it functioned as a research and isotope production plant only. The Shippingport Atomic Power Station was the world’s first full-scale atomic electric power plant devoted exclusively to peacetime uses. It was located near the present-day Beaver Valley Nuclear Generating Station on the Ohio River in Beaver County, Pennsylvania, United States, about 25 miles (40 km) from Pittsburgh. 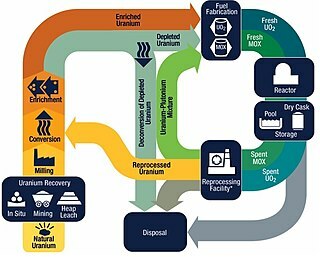 Startup neutron source is a neutron source used for stable and reliable initiation of nuclear chain reaction in nuclear reactors, when they are loaded with fresh nuclear fuel, whose neutron flux from spontaneous fission is insufficient for a reliable startup, or after prolonged shutdown periods. Neutron sources ensure a constant minimal population of neutrons in the reactor core, sufficient for a smooth startup. Without them, the reactor could suffer fast power excursions during startup from state with too few self-generated neutrons. In applications such as nuclear reactors, a neutron poison is a substance with a large neutron absorption cross-section. In such applications, absorbing neutrons is normally an undesirable effect. However neutron-absorbing materials, also called poisons, are intentionally inserted into some types of reactors in order to lower the high reactivity of their initial fresh fuel load. Some of these poisons deplete as they absorb neutrons during reactor operation, while others remain relatively constant. A neutron howitzer is a neutron source that emits neutrons in a single direction. It was discovered in the 1930s that alpha radiation that strikes the beryllium nucleus would release neutrons. The high speed of the alpha is sufficient to overcome the relatively low Coulomb barrier of the beryllium nucleus, the repulsive force due to the positive charge of the nucleus, which contains only four protons, allowing for fusion of the two particles, releasing energetic neutrons. 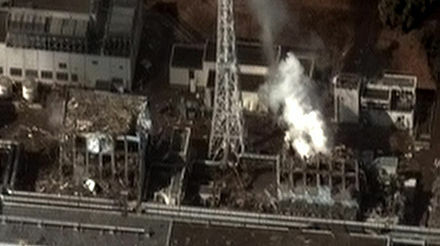 Following the 2011 Fukushima I nuclear accidents, costs are likely to go up for currently operating and new nuclear power stations, due to increased requirements for on-site spent fuel management and elevated design basis threats. However many designs, such as the currently under construction AP1000, use passive nuclear safety cooling systems, unlike those of Fukushima I which required active cooling systems, which largely eliminates the need to spend more on redundant back up safety equipment. Modern nuclear reactor designs have had numerous safety improvements since the first-generation nuclear reactors. A nuclear power plant cannot explode like a nuclear weapon because the fuel for uranium reactors is not enriched enough, and nuclear weapons require precision explosives to force fuel into a small enough volume to go supercritical. Most reactors require continuous temperature control to prevent a core meltdown, which has occurred on a few occasions through accident or natural disaster, releasing radiation and making the surrounding area uninhabitable. Plants must be defended against theft of nuclear material (for example to make a dirty bomb) and attack by enemy military (which has occurred)  planes or missiles, or planes hijacked by terrorists. The Vienna Convention on Civil Liability for Nuclear Damage puts in place an international framework for nuclear liability. However states with a majority of the world's nuclear power stations, including the U.S., Russia, China and Japan, are not party to international nuclear liability conventions. In 2013 China had 32  nuclear reactors under construction, the highest number in the world. A nuclear reactor coolant is a coolant in a nuclear reactor used to remove heat from the nuclear reactor core and transfer it to electrical generators and the environment. Frequently, a chain of two coolant loops are used because the primary coolant loop takes on short-term radioactivity from the reactor. The Energy Multiplier Module is a nuclear fission power reactor under development by General Atomics. 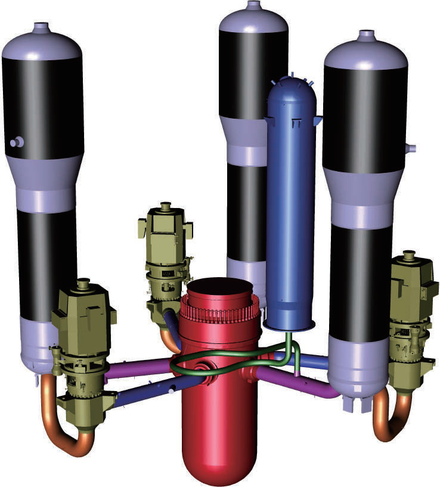 It is a fast-neutron version of the Gas Turbine Modular Helium Reactor (GT-MHR) and is capable of converting spent nuclear fuel into electricity and industrial process heat. ↑ "World Nuclear Power Reactors 2007-08 and Uranium Requirements". World Nuclear Association. 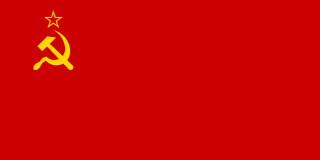 2008-06-09. Archived from the original on March 3, 2008. Retrieved 2008-06-21. ↑ "Nuclear Power Economics - Nuclear Energy Costs - World Nuclear Association". www.world-nuclear.org. ↑ "Graphite Reactor". 31 October 2013. Archived from the original on 2 November 2013. ↑ "Graphite Reactor Photo Gallery". 31 October 2013. Archived from the original on 2013-11-02. Retrieved 2013-11-01. ↑ "First Atomic Power Plant at X-10 Graphite Reactor". 31 October 2013. ↑ "Russia's Nuclear Fuel Cycle". world-nuclear.org. Retrieved 1 November 2015. ↑ "Queen switches on nuclear power". BBC Online . 17 October 2008. Retrieved 1 April 2012. ↑ William, Kaspar et al. (2013). A Review of the Effects of Radiation on Microstructure and Properties of Concretes Used in Nuclear Power Plants. Washington, D.C.: Nuclear Regulatory Commission, Office of Nuclear Regulatory Research. ↑ "How nuclear power works". HowStuffWorks.com. Retrieved September 25, 2008. ↑ "Nuclear Regulatory Commission Library - Main Condenser". ↑ "Cooling Power Plants | Power Plant Water Use for Cooling - World Nuclear Association". www.world-nuclear.org. Retrieved 2017-09-27. ↑ "the largest nuclear generating facility in the world". Archived from the original on 2013-01-02. 1 2 Kidd, Steve (January 21, 2011). "New reactors—more or less?". Nuclear Engineering International. Archived from the original on December 12, 2011. ↑ Ed Crooks (12 September 2010). "Nuclear: New dawn now seems limited to the east". Financial Times. Retrieved 12 September 2010. ↑ The Future of Nuclear Power. Massachusetts Institute of Technology. 2003. ISBN 978-0-615-12420-9 . Retrieved 2006-11-10. ↑ Daniel E Whitney (2003). "Normal Accidents by Charles Perrow" (PDF). Massachusetts Institute of Technology. 1 2 3 Benjamin K. Sovacool (January 2011). "Second Thoughts About Nuclear Power" (PDF). National University of Singapore. p. 8. Archived from the original (PDF) on 2013-01-16. 1 2 Massachusetts Institute of Technology (2003). "The Future of Nuclear Power" (PDF). p. 49. ↑ "Legal Experts: Stuxnet Attack on Iran Was Illegal 'Act of Force'". Wired. 25 March 2013. ↑ MacKenzie, James J (1977). "The Nuclear Power Controversy. Arthur W. Murphy". The Quarterly Review of Biology. 52 (4): 467–8. doi:10.1086/410301. JSTOR 2823429. ↑ Walker, J. Samuel (10 January 2006). Three Mile Island: A Nuclear Crisis in Historical Perspective. University of California Press. pp. 10–11. ISBN 978-0-520-24683-6. ↑ In February 2010 the nuclear power debate played out on the pages of the New York Times , see A Reasonable Bet on Nuclear Power and Revisiting Nuclear Power: A Debate and A Comeback for Nuclear Power? ↑ Kitschelt, Herbert P (2009). "Political Opportunity Structures and Political Protest: Anti-Nuclear Movements in Four Democracies". British Journal of Political Science. 16 (1): 57–85. doi:10.1017/S000712340000380X. JSTOR 193981. 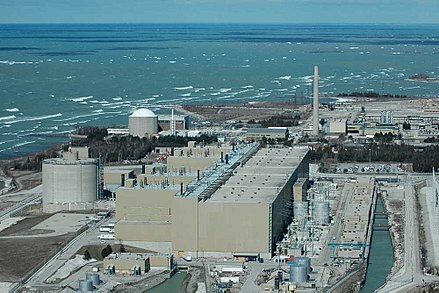 ↑ U.S. Energy Legislation May Be `Renaissance' for Nuclear Power. ↑ Bernard Cohen. "The Nuclear Energy Option" . Retrieved 2009-12-09. ↑ "Nuclear Energy is not a New Clear Resource". Theworldreporter.com. 2010-09-02. ↑ Greenpeace International and European Renewable Energy Council (January 2007). Energy Revolution: A Sustainable World Energy Outlook Archived 2009-08-06 at the Wayback Machine , p. 7. ↑ Giugni, Marco (2004). Social protest and policy change: ecology, antinuclear, and peace movements in comparative perspective. Rowman & Littlefield. pp. 44–. ISBN 978-0-7425-1827-8. ↑ Stephanie Cooke (2009). In Mortal Hands: A Cautionary History of the Nuclear Age , Black Inc., p. 280. ↑ Sovacool, Benjamin K (2008). "The costs of failure: A preliminary assessment of major energy accidents, 1907–2007". Energy Policy. 36 (5): 1802–20. doi:10.1016/j.enpol.2008.01.040. ↑ Jim Green . Nuclear Weapons and 'Fourth Generation' Reactors Chain Reaction, August 2009, pp. 18-21. ↑ Kleiner, Kurt (2008). "Nuclear energy: Assessing the emissions". Nature Reports Climate Change. 2 (810): 130–1. doi:10.1038/climate.2008.99. ↑ Mark Diesendorf (2007). Greenhouse Solutions with Sustainable Energy , University of New South Wales Press, p. 252. ↑ Diesendorf, Mark (2007). "Is nuclear energy a possible solution to global warming" (PDF). Social Alternatives. 26 (2). Archived from the original (PDF) on 2012-07-22. ↑ "Supply of Uranium". World Nuclear Association . Retrieved 2010-01-29. ↑ "Adieu to nuclear recycling". Nature. 460 (7252): 152. 9 July 2009. Bibcode:2009Natur.460R.152.. doi:10.1038/460152b. PMID 19587715. ↑ "Publications: International Conventions and Legal Agreements". iaea.org. Retrieved 1 November 2015. ↑ "Nuclear section of the UK Department of Trade & Industry's website". Archived from the original on 2006-02-15. ↑ "Nuclear Decommissioning: Decommission nuclear facilities". World-nuclear.org. Retrieved 2013-09-06. 1 2 "Совершенно секретно". sovsekretno.ru. Retrieved 1 November 2015. ↑ "Table 2. Quote: Designed operational life time (year) 60" (PDF). uxc.com. p. 489. ↑ "Rosatom launches annealing technology for VVER-1000 units". World Nuclear News. 27 November 2018. Retrieved 28 November 2018. ↑ Tomoko Yamazaki and Shunichi Ozasa (June 27, 2011). "Fukushima Retiree Leads Anti-Nuclear Shareholders at Tepco Annual Meeting". Bloomberg. ↑ Mari Saito (May 7, 2011). 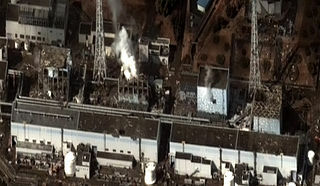 "Japan anti-nuclear protesters rally after PM call to close plant". Reuters. ↑ Beresford, N.A; Fesenko, S; Konoplev, A; Skuterud, L; Smith, J.T; Voigt, G (2016). "Thirty years after the Chernobyl accident: What lessons have we learnt?". Journal of Environmental Radioactivity. 157: 77–89. doi:10.1016/j.jenvrad.2016.02.003. PMID 27018344. ↑ Steve Kidd. Nuclear in France - what did they get right? Archived 2010-05-11 at the Wayback Machine Nuclear Engineering International, June 22, 2009. ↑ Robert Gerwin: Kernkraft heute und morgen: Kernforschung und Kerntechnik als Chance unserer Zeit. (english Nuclear power today and tomorrow: Nuclear research as chance of our time) In: Bild d. Wissenschaft. Deutsche Verlags-Anstalt, 1971. ISBN 3-421-02262-3. ↑ "Next-generation Nuclear Technology: The ESBWR" (PDF). American Nuclear Society. Retrieved September 25, 2008. ↑ "Olkiluoto 3 startup pushed back to 2018". World Nuclear News. 1 September 2014. Retrieved 28 October 2014. ↑ "Construction of Flamanville EPR begins". World Nuclear News. 4 December 2007. Archived from the original on 2014-10-14. Retrieved 28 October 2014. ↑ Patel, Tara; Bakewell, Sally (22 October 2013). "U.K. Nuclear Future Relies on Reactor Plagued by Delays: Energy". Bloomberg.com. Retrieved 28 October 2014. ↑ "Taishan generator stator lift". World Nuclear NEws. 11 October 2013. Retrieved 28 October 2014. ↑ "First criticality achieved at Chinese EPR". www.world-nuclear-news.org. 7 June 2018. Retrieved 23 June 2018. ↑ Harris, Emily (May 24, 2007). "Progress on Finnish Nuclear Reactor Lags". NPR News. Retrieved October 27, 2014. ↑ "Possible North Escambia Gulf Power Nuclear Plant Faces Fight". northescambia.com. Retrieved 1 November 2015. ↑ Halpi, Tony (April 17, 2007). "Floating nuclear power stations raise spectre of Chernobyl at sea". The Times . Archived from the original on July 6, 2008. ↑ "Indonesia planning to have four nuke power plants by 2025" . Retrieved October 23, 2011. ↑ "PRIS - Country Details". Iaea.org. Archived from the original on 2015-11-18. Retrieved 2013-09-24. ↑ McCarty, Dawn; Alpeyev, Pavel. "Toshiba Projects Record Loss as Nuclear Unit Files for Bankruptcy". Bloomberg . Retrieved 29 September 2017. ↑ Moylan, John (15 September 2016). "What is Hinkley Point and why is it important?" – via www.bbc.co.uk. ↑ Sokolov, F.; Fukuda, K.; Nawada, H.P. 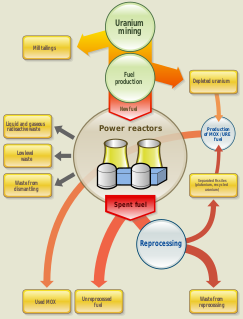 "Thorium fuel cycle — Potential benefits and challenges" (PDF). International Atomic Energy Agency . Retrieved 27 October 2014. 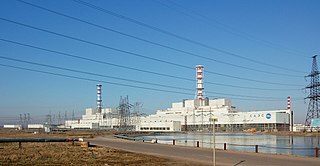 Wikimedia Commons has media related to Nuclear power plant .